Desert Wind Winery is located outside of Prosser and in addition to vineyards, winery and tasting room they also operate a restaurant and boutique hotel accommodations. The facility perched above the Yakima River, just off of highway 82 is hard to miss in it's desert inspired Santa Fe style architecture. Desert Wind is not a small winery by any stretch producing around 25,000 cases give or take from year to year. Because of their size they also offer a great many options in varietal bottlings, from Washington stand bys like Merlot, Syrah and Riesling to Barbera, Tempranillo and a couple blends. They've developed a great reputation on the strength of their consistency thanks to both vast vineyard holdings in reliable locations, and winemaker Mark Chagrin hands on approach despite the large production. The 2008 Desert Wind Cabernet hits the spot this Friday with a sub $20 wine that is also actually a single AVA bottling. 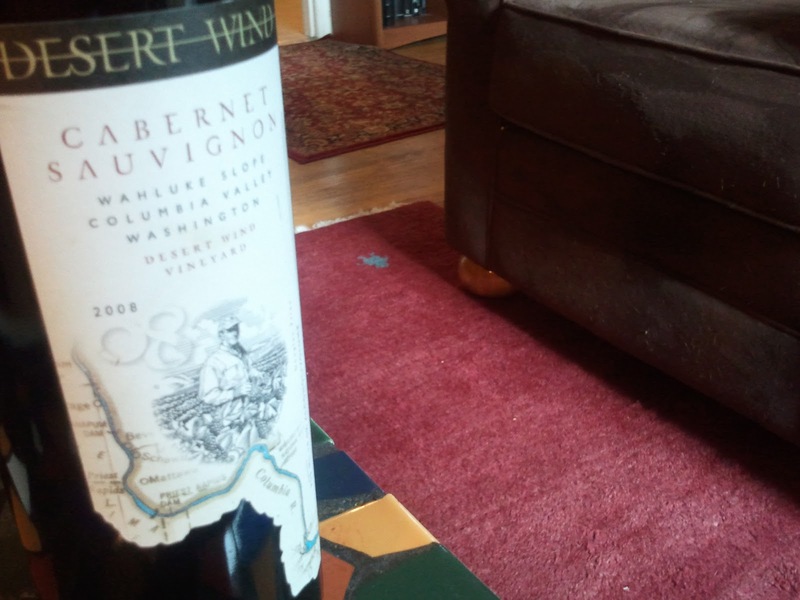 You're getting a great look at not just a Washington Cabernet, but what makes the Wahluke Slope so Dope, at least in this guy's opinion. This super reliable, warmer and dry site allows growers and winemakers to count on it time and again to produce wines that show true varietal character. This Cabernet is no different, the 100% American Oak doesn't spoil the party either. Lots of aromatics include sandalwood and dusty blackberries. The wine delivers a fruit forward Cabernet in Washington style, currants and cherries a nice finish for the price especially polishing off with a touch of mocha. Typically found for $16 to $18.